[Letter] 1864 May 23, Executive Mansion [to] Attorney General [Edward Bates]. 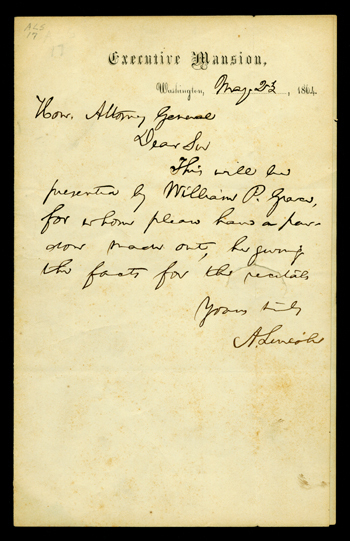 Lincoln requests the Attorney General [Edward Bates] to grant a pardon to the bearer, William P. Grace for giving the facts for the recitals. The recipient of the letter, Edward Bates, served as Lincoln's Attorney General from March 1861 to September 1864; prior to assuming these duties, he served as a member of the State legislature and as a Representative from Missouri (1827-1829).